CC is very pleased to announce the reboot of two of our longest running and most prolific teams – Creative Commons Australia and Creative Commons Aotearoa New Zealand. The new CC Australia team was launched at the recent Australian Digital Alliance‘s Copyright Forum 2015. Those who have followed CC for a while are no doubt familiar with CC Australia. Since 2006, the team has been operating out of the Queensland University of Technology (QUT) initially under the direction of Brian Fitzgerald and Tom Cochrane, and more recently under Professor Cochrane, Nic Suzor and Nerida Quatermass. Over its tenure at QUT CC Australia has achieved some amazing things, from launching the CC Case Studies project to having CC BY adopted as the default licensing policy for the Australian Federal government. AusGOAL lead by Baden Appleyard, who will be the Publicly Funded Information Lead. Both these organisations are already extremely prominent in the open community locally and internationally, and have been two of the strongest advocates for CC in Australia for many years. They have both already undertaken collaborative projects with Creative Commons, from the NCU’s Smartcopying website (updated to celebrate the launch) to an exciting IT project soon to be released by AusGOAL. It’s long overdue that they are recognised by welcoming them into the CC family officially. Together the new team of QUT, NCU and AusGOAL combines years of experience and expertise. In a similar vein, a few months ago CC New Zealand changed its official host organisation from the Royal Society of New Zealand to the Open Education Resources Foundation. While hosted by the Royal Society of New Zealand, CC Aotearoa New Zealand has consistently been one of CC’s strongest and most impactful affiliates, a great example to our whole community. It has particularly excelled in the education and cultural sectors, and New Zealand remains a world leader in the take up of CC by educational and GLAM institutions. At the same time we welcome the Open Education Resources Foundation to CC, and can’t wait to see where they lead us. We expect great things. In support of the #FreeBassel Day Wikipedia Edit-a-thon at the EFF, the Creative Commons Arab World will organize a virtual Arabic Wikipedia Edit-a-thon to translate and expand pages that cover topics of interest to him. Starting with the first round of grants in 2011 Creative Commons and a team of partners have been actively supporting US Department of Labor (DOL), Trade Adjustment Assistance Community College and Career Training (TAACCCT) grantees. This multi-year, nearly $2 billion grant program provides funds to US community colleges who in partnership with industry, employers, and public workforce systems create stackable/latticed credentials that can be completed in two years or less. 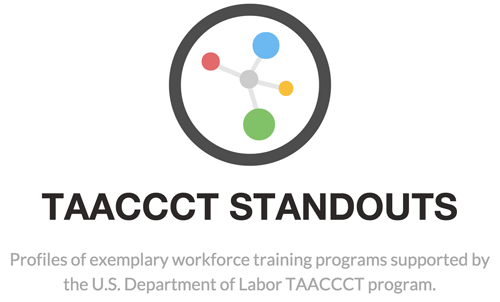 The goal of TAACCCT is to expand targeted training programs for unemployed workers, especially those impacted by foreign trade and to move unemployed workers into high wage, high skill jobs in high growth industry sectors. There are many unique aspects to the TAACCCT program. Creative Commons involvement stems from the DOL requirement that grantees allow broad access for others to use and enhance project products and offerings by licensing newly developed materials produced with grant funds with a Creative Commons Attribution License (CC BY). DOL is the first US department to require this in such a large grant program. Its size makes TAACCCT the largest Open Educational Resources (OER) initiative in the world. There is a high interest in seeing curricula and course materials coming out of TAACCCT. 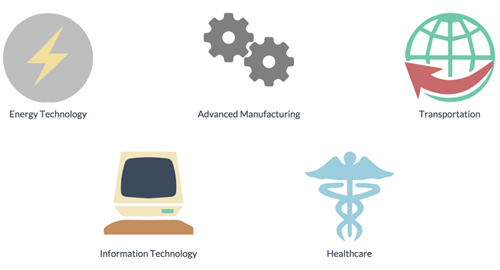 This is partly due to the high level of investment but also due to the high growth industry sectors for which curricula is being created including health, IT, energy, transportation, and advanced manufacturing – areas where little prior OER exists. However, grantees get 3-4 years for development so examples of work are only now emerging. In Oct-2014 at the TAACCCT-ON convening in Topeka Kansas, Creative Commons hosted a round 1 TAACCCT grantee showcase fair. All round 1 grantees were invited to showcase, share, and describe some of the best work coming out of their projects. Using a participatory process all the other grantees attending were invited to visit round 1 TAACCCT grantees at their showcase table to see and learn more about the work they are doing. To make it interactive and fun we asked grantees to put stickers on round 1 TAACCCT projects that were standouts for them. We sought standouts noteworthy for the way they fulfill TAACCCT grant priorities and standouts by industry sector. From that process, based on grantee selection, nine round one TAACCT grantee projects emerged as standouts. For each of the nine standouts we created a vignette with a video interview, a written story, and a graphic visualization of the project. We’re pleased to share the results with all of you – see TAACCCT Standout Profiles. These nine round 1 TAACCCT vignettes are a small, early sampling of the work coming out of the TAACCCT program. All TAACCCT grant projects are standouts in their own way. We hope these early examples satisfy some of the interest around seeing TAACCCT work and wet your appetite for seeing even more. Special thanks to all the grantees for agreeing to be interviewed and profiled in this way. Special thanks to Giulia Forsythe for the visuals she created to graphically illustrate each project, to Hal Plotkin for writing the stories, and to Billy Meinke for managing the whole production process. And most of all special thanks to the Bill & Melinda Gates Foundation for funding our support of TAACCCT grantees. We hope to see similar vignettes for rounds 2, 3 and 4. More information on the support Creative Commons and its team of partners provide to TAACCCT can be found at Open4us.org. Open Education Week is an annual convening of the global Open Education Movement to share ideas, new open education projects and to raise awareness about open education and its impact on teaching and learning worldwide. Open education encompasses resources, tools and practices that employ a framework of open sharing to improve education access, affordability and effectiveness. Participation in all events and use of all resources are free and open to everyone. Special thanks and congratulations to the Open Education Consortium for coordinating Open Education Week! Creative Commons has long celebrated everyone who uses our licenses. TeamOpen profiles give a good sense of the diversity of use and purpose. The creative ways individuals, not-for-profits, governments, and businesses use our licenses is inspiring. For every TeamOpen example there are many others who want to move in that direction but don’t know how. The question we frequently hear is, “How do I earn a living, pay the bills, and keep the lights on if I openly license my work and give it away for free?” This question is asked not just by entrepreneurs but by people in non-profits and government too. We are pleased to announce, through gracious funding from the Hewlett Foundation, that we’re launching a Creative Commons open business models initiative aiming squarely at showing how our licenses can, and are, used by businesses, non-profits, and governments. We aim to help businesses see how to use and contribute to the commons in a way that aligns with the norms and values of the commons, while at the same time operating as a business. We want to show what sustainability models look like. We’re planning to generate designs for how to move from closed to open. We want to provide models for businesses whose aim is to provide products and services that have both economic and social value. We aim to make visible how open business models work and provide tools and strategies for designing and developing your own. We want to do this work in a community-based way with all of you. So this blog post is an open call for participation. The Creative Commons open business models initiative provides you with a set of interactive tools which you can use to design your own open business models. You can use the tools to model anything from a new startup open business to an existing open business, or something in between. The Creative Commons open business models initiative asks you to share the models you come up with including your analysis of your own models and provide suggestions for improvement of the open business model tools themselves. Join us in designing, developing, and iterating a set of interactive Creative Commons open business model tools that anyone can use to design an open business model. Use these open business model tools yourself to generate your own open business model(s). Share the results of your participation including the open business models you generate. Provide feedback and recommendations for improving the Creative Commons open business model tools and process. Partner directly with Creative Commons on developing an open business model for your specific initiative. 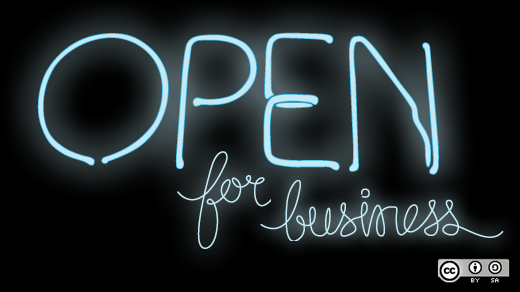 Participate in a Creative Commons workshop on generating open business models. Contribute to a Creative Commons open business models report. See our Creative Commons Open Business Models Participation Activities document for further details on each of these activities, including specifics for participation, and links to the tools. We’re excited about doing this work with all of you and growing the commons through open business models. Bassel Khartabil (also known as Bassel Safadi) is a computer engineer who, through his innovations in social media, digital education, and open-source web software, played a huge role in opening the Internet in Syria and bringing online access and knowledge to the Syrian people. Many people reading this blog know Bassel through his work as lead for CC Syria. Sunday, March 15, 2015 marks the third anniversary of Bassel’s arrest and imprisonment in Syria, as well as the fourth anniversary of the Syrian uprising. No prior Wikipedia editing experience is necessary, we’ll have experienced editors present to help you get set up and make your first edit. Artists and activists interested in freedom of expression are encouraged to come contribute to the discussion. Experienced Wikipedians also welcome to come learn more about Bassel, contribute to Wikipedia, and help others to become involved. For more details on the #FreeBassel Day event, click here. This entry is remixed from Wikipedia:Meetup/San Francisco/FreeBassel Day 2015, available under CC BY-SA. The Museum of Modern Art (MoMA) announced today its acquisition* of the Creative Commons logo and license icons into its permanent collection, currently featured as part of a new exhibit called, “This Is for Everyone: Design Experiments for the Common Good.” The Creative Commons logo (double C in a circle) and license icons for Attribution, ShareAlike, Noncommercial, and NoDerivatives are featured alongside universal designs such as the @ symbol and the International Symbol for Recycling. “The exhibition takes its title from British computer scientist Tim Berners-Lee, inventor of the World Wide Web, who lit up the stadium at the 2012 London Summer Olympics opening ceremony with a simple tweet: “This Is for Everyone.” His buoyant message highlighted how the Internet—perhaps the most radical social design experiment of the last quarter century—has created seemingly limitless possibilities for discovering, sharing, and expanding knowledge and information. The Creative Commons logos, and the organization and movement for the commons they represent, fit solidly within this narrative of imagining a better world through design — and Creative Commons is honored to be featured in this new exhibit and acquired as part of MoMA’s permanent collection. We’d especially like to highlight the designers: Ryan Junell of the original and now standardized CC logos, Alex Roberts of the re-conceived Attribution icon. Read more about the acquisition at the MoMA blog and Wired’s coverage of the exhibit. Also stay tuned for a more detailed post on the origin story of the CC logos. * Different museums have different criteria for acquiring objects into their collection. Here’s MoMA’s criteria in context of its @ symbol acquisition. To acquire doesn’t mean to own, but to obtain permission for reproducing the work as a matter of copyright. Our logos are still our trademarks! A guest post by CC Malaysia Lead, Muid Latif. In the recent years, Malaysia has been more active in adopting open culture. Local mainstream media has provided a continuous platform for Creative Commons Malaysia to reach out to Malaysians in promoting CC, and both government and the community have been proactive in spearheading interesting online projects for everyone’s benefit. For example, last December I had the chance to approach several local musicians and producers who are familiar with Creative Commons licenses on SoundCloud to find out if they were keen to have their music under a CC license. It was great to see that local musicians are very supportive of CC and how it empowers their works. This resulted in the release of CC Malaysia’s very own Creative Commons Malaysia Mixtape 2015. Inspired by this year’s World CC Mixtape, the Malaysia collection features 12 tracks from eight artists: the notable DJ Rezabudculture, Space Gambus Experiment, Metahingaq, NERO ONE, Z-1, Zam Nayan, Ugendran and Mohammad Yazid. The tracks are mostly uptempo or experimental. Listen to it here. Our community also wants to play a greater role in open data. One of the biggest outcomes from this is Sinar Project, a mainly volunteer-run organisation which uses open technology and applications to make government information–such as budget expenditure and assets of those holding political office and parliamentary bills–public and more accessible to the Malaysian people. The Sinar project won a 2014 Information Society Innovation Fund (ISIF Asia) Award, under the “Rights” category (see more here). The Malaysian government has also taken the initiative to progress open data by setting up www.data.gov.my as well as adopting Big Data Analytics (BDA) mandates to the Ministry of Communication, the Multimedia, Malaysian Administrative Modernisation and Management Planning Unit (MAMPU) and Multimedia Development Corporate (MDeC). In this context, I have recently had the chance to contact the founder of the Big Data Malaysia network, Tirath Ramdas, about his view on open data here in Malaysia and concerns about citizen engagement. He thinks that open data is not a one way street. Any investment into open data from government will be a waste of taxpayer funds if the Malaysians do not make productive use of the data released. Raising general awareness of open data is therefore be highly important at this point in time. With this in mind, MDeC and Tentspark, an IT solutions provider, recently launched the National Big App Challenge to stress the importance of big data analytics in solving Malaysia’s challenges related to national issues and societal well-being. In the near future, we would love to see Malaysia join the Open Government Partnership (OGP), following the Big Data Analytics Framework goal to have the framework ready by the end of this year and in line with the Digital Malaysia 354 Roadmap (DM354 Roadmap). With increased focus on sharing by both the government and private citizens, there seems to be a good chance for this to happen. Today we commemorate Fair Use Week, a week-long celebration of the doctrines of fair use and fair dealing. Creative Commons is proud of how its licenses respect fair use and other exceptions and limitations to copyright. CC licenses end where copyright ends, which means you don’t need to comply with a CC license if you don’t need permission under copyright. You will hear us repeat this fundamental design principle about our licenses often because it is important in practice, but even more so as policy. Anything that claims to grant “permission” to do things allowed under fair use is problematic because it promotes “permission culture” and increases FUD (fear, uncertainty and doubt) about fair use. This maxim goes for open licensing just as it does anything else, which is what makes the treatment of fair use in our licenses so important. Even so, there remains some potential tension between open licensing and fair use. There are a few reasons for this. The first is that relying on fair use to include content in an otherwise openly-licensed work can make it difficult for people around the globe to reuse your work. While most countries have some form of fair-use-like rights, those rights are not harmonized internationally. That means it is possible that the portion of your work used under fair use would have to be carved out before it is reused in some jurisdictions. Proper marking of what content falls outside the scope of the license can help minimize this problem. The other potential tension results from the gray area around where fair use begins and ends. Thanks in no small part to the work of Peter Jaszi and Patricia Aufderheide, the public has a much better idea of how fair use plays out in practice than it used to. But inevitably, some challenging fair use questions remain. When reusers are faced with those close cases, some opt to use CC-licensed work instead of relying on fair use of an all rights reserved work. By providing a licensed alternative, CC licenses provide a nice cushion for fair use in those situations. But in other contexts, reusers have to decide whether to rely on fair use when reusing a CC-licensed work. While it is common practice to give attribution when using something under fair use, complying with other CC license restrictions is often impossible when relying on fair use. This is exactly how it should be. As we know, using a work under fair use means the CC license is irrelevant and the license terms do not apply. Creative Commons never discourages reusers from relying on fair use or other exceptions or limitations to copyright, even when that means not complying with a CC license. Respect for fair use was written into the code of our licenses from the start, and that has not changed. We recognize that fair use is a muscle, and it needs to be exercised. Now go workout. Creative Commons dedicates the text of our licenses and other legal tools, as well as the text of our Commons deeds, to the public domain using the CC0 Public Domain Dedication. While that doesn’t mean that anything and everything is allowed by those choosing to reuse these materials (as explained below), we believe that copyright isn’t a good fit for every creative work, and we don’t think it is right to leverage it as a stick in these instances. CC has never asserted copyright in the text of our licenses or other legal tools. We made our policy clearer a few years ago by specifically declaring they are released under CC0. The text of the licenses, public domain tools, and license deeds we publish are all unrestricted by copyright worldwide, and we recently added a sentence to that effect in the notice at the bottom of our licenses and CC0. Although these materials are public domain as a matter of copyright, the Creative Commons name and logo are our trademarks and can only be used according to our trademark policy. This can be a difficult concept to communicate: while we want people to freely reuse the texts of our legal tools and deeds, we don’t want to give people the wrong idea about what we enable and what we do not: the difference between copyright and trademark can be complicated. We’ve had a long-standing policy against use of our trademarks or name in connection with modified versions of our legal tools and other products (like our deeds). We’ve tried to make this policy simple and understandable, and just updated it for added clarity, though substantively nothing has changed from when CC published the first licenses in 2002. In a nutshell, we need to be sure the public is not confused about what comes from and is supported by Creative Commons, and what isn’t. We need to be sure the public doesn’t associate CC with other content and materials. While we hope this is simple enough to need no further explanation, if you want to reuse CC materials in a way that uses or associates our name or logos, please see our trademark policy to be sure you’re in the clear or contact CC. We appreciate and want credit for our work! We just don’t require it as a condition of exercising rights that we control under copyright. Even though CC0 imposes no legal obligation to provide attribution, courtesy, good practice, norms, and community expectations often mean that you should give credit anyway. (For example, we recommend CC0 for scientific data, but many reusers include source information, both to acknowledge others’ work and to establish the data’s provenance.) Giving proper credit helps others understand the origin of the text so they can learn more and identify any changes that have been made. That may not always be reasonable or possible, but in any case we won’t be using copyright as a means to enforce our request for credit. For more information, you might find our guidelines for using public domain material instructive. Creative Commons provides a standard set of licenses suitable for a wide variety of uses and situations. Our licenses reduce the need for custom licenses that create separate pools of material under incompatible terms (i.e. “license proliferation”). By choosing not to use copyright to restrict modifications of CC license text, we recognize we may be encouraging license proliferation, because people will feel free to remix the content and publish their own, new custom license. This is a fair criticism, but it fails to account for the reality that those wanting different terms will make that happen with or without repurposing our text. We believe our efforts are better focused on explaining the rationale for standard licensing, and helping creators understand that as much as they may think they need specialized terms, that those sometimes (if not often) work against their sharing goals and inflict more harm than provide benefit. This includes additional transaction costs for them and their reusers, who are forced to understand specialized terms unique to the custom license. Withholding permissions and exercising copyright in legal tools are hardly effective tools in this campaign against license proliferation—those who want their own licenses will make that happen whether or not we impose some rights reserved (or even all rights reserved) on the text of our legal code. We will, however, continue to strongly encourage would-be custom license creators to use our standard licenses, which have a long history and a thriving user base as well as robustness internationally, rather than creating new custom and incompatible licenses and legal tools. We believe in creating a vibrant commons, that maximizes the ability of others to build upon our works with the least restrictions possible. We hope you will consider joining us by using CC0 for your own materials! With the Dutch translation of the 4.0 licenses published today, we now have a second translation of the complete set of current CC legal tools, and the first one by a cross-jurisdiction team! CC Netherlands and CC Belgium worked together on this translation, as well as Kennisland and the Institute for Information Law (part of the University of Amsterdam). Our thanks and congratulations to the translation team of Maarten Zeinstra (CC-NL, translation coordinator), Lucie Guibault (CC-NL, legal lead), Yannick H’Madoun (CC-BE), Lisette Kalshoven (CC-NL), Tamara Mangelaars (Kennisland, editor), Tiara Roquas (CC-NL intern), and Tessa Askamp (CC-NL, technical interpreter). Additional help was provided by law students from the Institute of Information Law (Rutger de Beer, Sarah Johanna Eskens, Sam van Velze, Marco Caspers, and Alexander de Leeuw), and CC’s own regional coordinator (and native Dutch speaker) Gwen Franck. PLOS enters its 12th year poised to deliver innovations that will make science publishing easier, faster and more satisfying. Thanks to everyone involved, we draw on a robust peer review community, high author satisfaction and global reach to be a leading Open Access publisher. At the core, though, it’s the articles that matter. In 2014 PLOS published more than 33,000. In 2014, readers worldwide viewed approximately 11.6 million PLOS articles each month. These articles were published by authors from more than 200 countries with the assistance of nearly 7,000 academic editors and 90,000 reviewers. Quality reporting by our authors in their research articles, deep dives into key topics by authors and editors in collections, thought-provoking perspectives by the community and discipline-specific channels for discussion bring readers to the more than 140,000 papers published since 2003. Let the numbers speak for themselves as you peruse the PLOS 2014 infographic and consider yourself part of this global community dedicated to quality science. Click on the image at right to see the full infographic. The post 2014: By the Numbers appeared first on The Official PLOS Blog. Creative Commons and the Open Policy Network hosted the first Institute for Open Leadership meeting in San Francisco 12-16 January 2015. The Institute for Open Leadership (IOL for short) is a training program to identify and cultivate new leaders in open education, science, public policy, research, data and other fields on the values and implementation of openness in licensing, policies and practices. The rationale for the IOL is to educate and empower potential open advocates within existing institutional structures in order to expand and promote the values and practices of the idea that publicly funded resources should be openly licensed. There was significant interest in the first iteration of the IOL program: we received over 95 applications and selected 14 fellows for the first Institute. The fellows came from around the world (Bangladesh, Barbados, Chile, Colombia, Greece, Nepal, New Zealand, Poland, Portugal, Somalia, United States ), and reflect a wide range of institutions–from community colleges to government sector to public radio. The central component of the IOL program requires fellows to develop, refine, and implement a capstone open policy project within their home institution. Creative Commons staff and other selected mentors provided guidance throughout this process. Overview of Creative Commons and open licensing, as this is a key aspect to all open policies. Deep dive into open policy, including identifying existing real world examples, sharing lessons learned, discussing the value proposition, sharing typical opposition arguments. Discussion of practical development of policy roadmaps and roll-out strategies across different sectors/institutions. Campaign planning and advice/best practices about how to communicate with decision makers about open policy. Identification of resources in support of open policy development and implementation, including presentations, reports, videos, informational and promotional materials. Sharing of best methods for educating and informing decision makers about open policy, including workshops, courses, hackathons. Hewlett Foundation communication team interviewed multiple IOL fellows for a Hewlett story on the power of CC licensing. Mentors included Cable Green, Paul Stacey, Timothy Vollmer and Puneet Kishor from Creative Commons and Nicole Allen and Nick Shockey from SPARC. Each of these persons had specific subject-area expertise and acted as a “mentor” for two or more of the fellows. We grouped the fellows based on their project ideas with a mentor in the following categories: Open Educational Resources, Open Access, Open Data, Open GLAM (galleries, libraries, archives, museums), and Open Business Models. During the week, we provided time for fellows to work individually, with other fellows, and with their mentors. On the final day of the in-person Institute we asked each fellow to report back on their progress from during the week, and asked each to answer common questions, such as talking about their open policy project objectives, planned activities to meet those objectives, identification of challenges they expect to face, partners they plan on working with, and metrics for success. In addition to the whole group discussions, mentor breakouts, and individual work, we included informational and motivational speakers to talk with the fellows over our lunch breaks. These talks were given by individuals with experience working in open policy across a variety of sectors, including Hal Plotkin (former Senior Policy Advisor within the U.S. Department of Education), Abel Caine (OER Program Specialist at UNESCO), Heather Joseph (Executive Director at SPARC), Laura Manley (Project Manager at Open Data 500) and Romain Lacombe (Plume). With the successful completion of the in-person portion of the IOL, the fellows have now returned to their home countries and will begin the process of implementing their open policies. The mentors are committed to continue working with their respective fellows, including providing advice and assistance. Fellows and mentors will meet to discuss progress over webinars planned for the following months. The goal is for the fellows to have implemented their open policy at the institution within a year. The fellows will be able to share more information about the implementation of their capstone policy projects in the coming months. We’ve already solicited feedback from fellows and are currently evaluating the activities and structure of the just-completed IOL. There are already several improvements we’d like to see as we begin to develop the second round of the IOL, to be held outside of North America in January 2016. We plan to open the application process for round two in mid-2015. The demand for IOL is large and additional funding is being sought to support additional ones beyond the first two. Note: Lucasfilm has offices inside The Presidio, where the IOL took place. Thus, Yoda. One of the aims of the Institute For Open Leadership is to link participants together into a global network. Participants from this inaugural Institute for Open Leadership, and all future ones, become part of a peer-to-peer network providing support for each other, asking and answering questions, and getting ongoing help with open policy development and implementation. This network helps participants overcome barriers and ensure open policy opportunities come to fruition. Today the Ford Foundation announced an open licensing policy for all of their grant-funded projects and research. The new arrangement came into effect February 1, 2015 and covers most grant-funded work, as well as the outputs of consultants. The Ford Foundation has chosen to adopt the CC BY 4.0 license as the default for these materials. Grant agreements will now include a paragraph requiring the grant recipient to broadly share all copyrightable products (such as research reports, photographs, videos, etc.) funded by the grant under CC BY. And the Ford Foundation is leading by example by adopting CC BY for all materials not subject to third-party ownership on their own website. The Ford Foundation is an independent, nonprofit grant-making organization created in 1936. Its mission is “to strengthen democratic values, reduce poverty and injustice, promote international cooperation, and advance human achievement.” In 2013 the Ford Foundation granted almost $570,000,000 to projects and organizations around the world. The Ford Foundation joins several other philanthropic grantmaking organizations who have adopted Creative Commons licensing policies for the outputs of their charitable giving. We’ve highlighted several over the last few months, including the William and Flora Hewlett Foundation (who also now require CC BY for all their project-based grantmaking) and the Bill & Melinda Gates Foundation (who adopted a CC BY open access policy for published grant-funded research and data). Releasing grant-funded content under permissive open licenses like CC BY means that these materials can be more easily shared and re-used by the public. And they can be combined with other resources that are also published under an open license. Congratulations to the Ford Foundation on adopting an open licensing policy that will encourage the sharing of rich content and data in the digital global commons. Creative Commons continues to urge other foundations and funding bodies to emulate the ongoing leadership of the Ford Foundation by making open licensing an essential component of their grantmaking strategy. Free Software Foundation Bulletin by Osama Khalid under BY-SA 2.0. 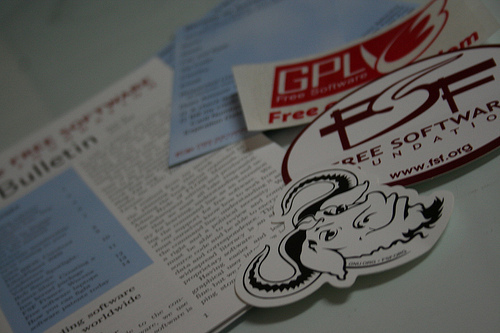 Together with the Free Software Foundation, Creative Commons has officially proposed the GNU General Public License version 3 as a candidate for compatibility with CC BY-SA version 4.0. The announcement was made on the CC license development mailing list on January 29th, kicking off what will be at least a month-long discussion period before a final compatibility determination is made. This proposal is significant because it would bridge a gap between two of the most widely-used copyleft licenses for code and content. Currently, developers are sometimes reluctant to integrate BY-SA content into GPL projects because of uncertainty about how the two licenses work together. Eliminating obstacles to remix between licenses so similar in aim and spirit is precisely what the compatibility mechanism in BY-SA was designed to do. However, there are differences between the two licenses that pose issues for the CC and FSF communities to consider before declaring compatibility. Over the next several weeks, we will be leading a public discussion about those topics, ensuring the final decision will be informed by community input. We encourage anyone interested to join the discussion by signing up here. GPLv3 is the second candidate for ShareAlike compatibility considered by Creative Commons. The Free Art License version 1.3 was considered under CC’s established compatibility process and criteria and was declared compatible in October 2014. 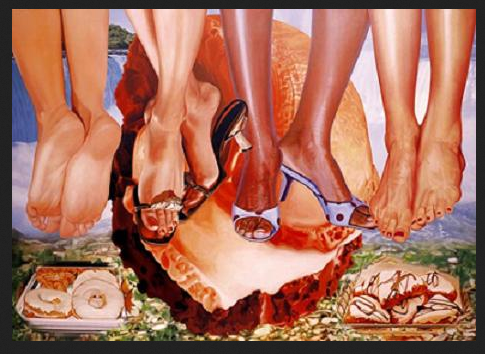 Join us in San Francisco at Park Life Gallery on 13 February 2015 for a Creative Commons DIY Salon. This salon features local artists who celebrate inexperience, sharing culture, and self-taught expertise in projects ranging from publishing and printmaking, to web-based collaborative music communities, to building open source libraries and visualizations. This event also celebrates the San Francisco launch of I Can Do Anything Badly 2: Learning By Doing is a Shared Responsibility, a Creative Commons licensed artist’s book by Hoël Duret & The Big Conversation Space, designed by Frédéric Teschner, which features conversational interviews in English and French about DIY culture – from computer programming and independent publishing, to Wikipedia and furniture design. Talks will be interspersed with ambient music performances from musicians from the Disquiet Junto. On January 26th, 2015, the Free Music Archive put out a call for entries for their ‘microSong Challenge.’ The first of three consecutive contests the Free Music Archive will run through spring of 2015, the microSong Challenge requires participants to pack a whole song into 15 seconds or less – the maximum length for most video-sharing app platforms (some are even shorter). The Free Music Archive is a repository for curated tracks (currently almost 80,000) that are licensed under Creative Commons, Public Domain and FMA-only licenses that allow for the tracks to be streamed, downloaded and shared for free. Some content may be used in videos or remixes, depending on how it’s licensed. From January 26th until February 20th, 2015, any registered FMA user can submit their miniscule composition(s) to the Free Music Archive. It’s free to sign up for an FMA account, and anyone 13 or older can enter the running. There will be a link to the contest on the homepage. will receive a 3-D printer and runners-up will get prizes from Creative Commons and the Free Music Archive’s BFF radio station, WFMU. Each microSong must be submitted in MP3 format. Every microSong will be licensed under a Creative Commons Zero license so that it can be freely used by anyone in a video, remix, extraordinarily brief performance art piece, miniature karaoke competition, or anything else they can come up with. A basis for predicting which communities will see more cases of flu resulting from vaccination decisions as revealed by geographically-based Twitter sentiments. Described by PLOS Computational Biology Associate Editor Marcel Salathé as a “mix of exciting science, modern everyday technology and public health,” this interdisciplinary approach is developing just in time to meet increased demand for improved forecasting of infectious disease outbreaks before they reach epidemic or pandemic stages. A significant driver for the quantitative and qualitative breakthroughs setting these papers apart from previous work in the field was the openness of the raw data underlying their findings and the source codes underlying their models, as well as the openness of the research processes and final publications. To receive email notices of new articles published by PLOS Computational Biology go here. The post Researchers Changing the Way We Respond to Epidemics with Wikipedia and Twitter appeared first on The Official PLOS Blog. Congratulations to the CC Finland team for the Finnish translation of CC0! If it seems like you just saw them featured here, you’re not mistaken; they published the first official translation of the 4.0 suite just a few months ago, and now they are the first to have the complete set of CC legal tools available in their language. Our thanks and congratulations again to the team of Maria Rehbinder of Aalto University, legal counsel and license translation coordinator of CC Finland; Martin von Willebrand, Attorney-at-Law and Partner, HH Partners, Attorneys-at-law Ltd: for translation supervision; Tarmo Toikkanen, Aalto University, general coordinator of CC Finland; Henri Tanskanen, Associate, HH Partners, Attorneys-at-law Ltd: main translator, and Liisa Laakso-Tammisto, translator, with thanks to Aalto University, HH Partners, and the Finnish Ministry of Education and Culture for their support. Today, we’re opening up a new job posting, for a developer. This person will work with our education team and existing technical lead to develop tools that facilitate the discovery, curation, use and re-use of freely available online content. The job will involve leading an overhaul of CC’s Open Education Resources (OER) Policy Registry and combine it with other catalogs to create a one-stop, global Open Policy Registry hosted under the umbrella of the Open Policy Network. Creative Commons is a global nonprofit organization focused on enabling the open commons of knowledge to grow and flourish. Our work crosses multiple sectors of creativity and knowledge — from photography, to music, to open educational resources, copyright reform, and open data. Today the commons includes over 880 million CC-licensed works, and we expect to pass 1 billion works in 2015. Are you excited about powering the technical infrastructure of Creative Commons? Learn more and apply.